Phoborisut, P. (2013, November). Re-enacting the traumatic memory of the 2010 crackdown in Thailand. Presented at the National Communication Association, Performance Studies Division, Washington D.C.
Phoborisut, P. (2015, August). The discourse of sacrifice in natural disaster: The case study of Thailand’s 2011 Floods. Presented at the Association for Education in Journalism and Mass Communication (AEJMC) Conference, Mass Communication and Society Division, San Francisco: CA. Co-organizer and speaker at the Thailand Update 2018, co-sponsored by the School of International and Public Affairs, the New York Southeast Asia Network, and the Asia-Pacific Economic Cooperation Study Center at Columbia University. Phoborisut, P. (2017, October 14). “Visual Storytelling on Social Platforms.” Southern California regional conference of the Journalism Association of Community Colleges, Cal State, Fullerton, CA. Phoborisut, P. (2017, April 19). “The Thai Junta’s Suppression: Deterritorializing Dissident Terrain.” Presented at the Faculty Club, organized by the Weatherhead East Asian Institute, Columbia University. New York, NY. Phoborisut, P. (2016, April 8). “Life Under the Military Regime: Visuals of the Unruly Citizens and Suppression.” Presented at the Thailand Update 2016, organized by the Weatherhead East Asian Institute, Columbia University. New York, NY. Phoborisut, P. (2015, April 1). “Visualizing Thai protests: Self(ie) activism against the 2014 coup.” Presented at New Media, Cyber-activism and Social Movement in Asia, organized by the Harvard-Yenching Institute. Boston, MA. Phoborisut, P. (2013). [Review of the book The Souls of Black Folk, by W.E.B. Du Bois]. Manusya: Journal of Humanities, 16.2, 78-79. Phoborisut, P. (2008). “Understanding the identity of the Thai Muslim community of Kudi Khao in Thonburi.” Manusya: Journal of Humanities, 16, 68-81. Phoborisut, P. (2009). “The use of new media in disseminating political communication during Thailand’s politics in transition.” In I. Yusuf, & C. Antilgan (Ed. ), Religion, Politics and Globalization, pp. 154-167. Bangkok: Konrad-Adenauer-Stiftung. Phoborisut, P. (2003). “Flowers on the streets of Bangkok.” In B. Sumrongthong, & S. Nakagawa (Ed. ), Urban Culture Research Vol.1: What’s Happening on the Street? 1, pp. 92-106. Bangkok: Urban Culture Research Center Bangkok Office. Phoborisut, P. (2018, November). “Selfies in Activism: The Visuals of the Unruly Bodies in Thai Protests.” To be presented at the National Communication Association (NCA) Conference, Asian/Pacific American Caucus, Salt Lake City, UT. Phoborisut, P. (2018, October). “The Thai Cave Drama: Proliferation of the Thai State’s Nationalism.” To be Presented at the Council for Thai Studies (COTS) Conference. University of Wisconsin-Madison, WI. Phoborisut, P. (2018, May). “The Rhizomatic Activism in Thailand: Voicing Dissent Against the Junta Government.” Presented at the International Communication Association (ICA) Conference. Activism, Communication and Social Justice Division, Prague, Czech Republic. Phoborisut, P. (2018, March). “Charting the Cartography of the NCPO’s Media and Technology Policy on its Path to Thailand 4.0.” Presented at the Association of Asian Studies (AAS) Conference, Washington D.C.
Phoborisut, P. (2017, November). “Absence Proliferates Narratives: The Case of the Removal of the 1932 Revolution Plaque.” Presented at the Council for Thai Studies (COTS). University of California-Los Angeles, CA. Phoborisut, P. (2017, November). “Communicating Activism and Social Movements in the Asian Pacific Region.” Presented at the National Communication Association (NCA) Conference, Asian/Pacific American Caucus, Dallas, TX. Phoborisut, P. (2017, June). “Re-configuring conversations in politics with the Facebook-native political cartoon.” Presented at the Association for Asian Studies (AAS) in Asia Conference, Korea University, Seoul, Korea. Phoborisut, P. (2017, May). “Public Performances as Assemblages: Contesting the Narrative of Thailand’s 2010 Crackdown.” To be presented at the International Communication Association (ICA) Conference, Political Communication Division, San Diego, CA. Phoborisut, P. (2017, February). “The Violence of “Returning Happiness”: The case of Thailand’ ruling junta’s attempts to bring happiness and peace to its people.” Presented at the Western States Communication Association (WSCA) Conference, Salt Lake City, UT. Phoborisut, P. (2015, November). “Mockingjay, mocking the junta: The anti-coup activism in Thailand.” Presented at the National Communication Association, Visual Communication Division, Las Vegas, NV. Phoborisut, P. & Sun, Y. (2015, November). “The news frames in communicating natural disaster: A study on the 2011 floods in Thailand.” Presented at the National Communication Association, Asian and Pacific American Caucus, Las Vegas, NV. Phoborisut, P. (2014, November). 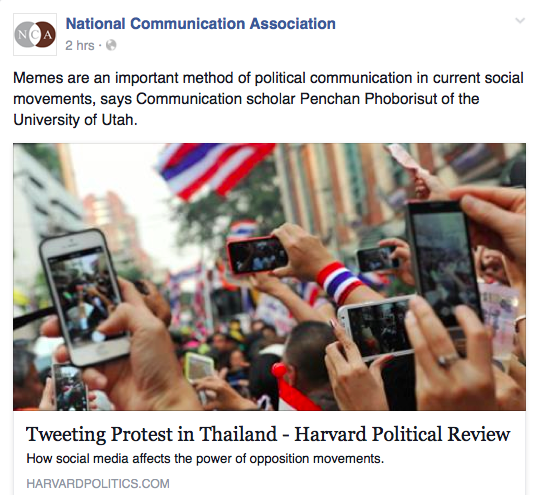 “Memes as political participation: A case study on Thailand.” Presented at the National Communication Association (NCA) Conference, Visual Communication Division, Chicago, IL. Phoborisut, P. (2014, November). “The discursive kitsch at protest sites: Thai grassroots protesters “talk back” during the 2010 crackdown.” Presented at the National Communication Association (NCA) Conference, Asian and Pacific American Caucus, Chicago, IL. Phoborisut, P. (2014, October). “Anti-dam activism in the digital age and the absence of marginalized voices.” Presented at the Council on Thai Studies Conference, University of Wisconsin-Madison, Madison, WI. Phoborisut, P. (2014, February). “The metaphors of natural disasters.” Presented at the Western States Communication Association, Environmental Communication Division, Anaheim, CA. Phoborisut, P. (2015, April). “Teaching in the Distracted Age: What Communication Students Expect from Online Courses?” Presented at the Broadcast Education Association Conference, Las Vegas, NV. Phoborisut, P. (2007, April). “Thailand’s National Reconciliation Commission Documentary Project. The International Documentary: In the Curriculum and in the World.” Presented at the Broadcast Education Association Conference, Las Vegas, NV.